Nose: Malted barley is fully present – rich and creamy. Some slight floral notes that are so very Bruichladdich, and the slightest waft of a sea breeze – but predominantly creamy sweet malted barley. Palate: Quite a complex beast this one – so many flavours bumping into each other, yet not fighting each other at all. There’s loads and loads of malt everywhere; clean and crisp, yet creamy and sweet without being cloying. Some winter fruits – green apple peel and some juicy pear. The smallest dash of honey, some light citrus notes, and the smallest pinch of ginger almost as an afterthought. Like with all of the modern Bruichladdich releases, this release has absolutely no peat at all. Mouthfeel: Thick and lusciously creamy with an almost gripping, bear-hugging texture. Like the old Kraft peanut butter ad – it’s neither oily nor dry. Amazing. Finish: The sweet creamy notes of the malt linger long in the finish, with the winter fruits not entirely departing, and now accompanied by some vanilla and a few fleeting spices. Bruichladdich’s Islay Barley line is pure Islay from top to bottom: all of the barley is grown on the island – in this case at the Dunlossit Farm – then malted on the island, distilled on the island at Bruichladdich with local water, warehoused on the island, and then bottled on the island (and if you’re luckier than I, drunk on the island!). Pretty much the only item in the entire process that isn’t local is the casks – which are American oak. Islay Barley lives and breathes Bruichladdich’s “terroir matters” mantra, with not just the malting, distilling, and warehousing taking place locally; but also the growing of the barley – which they narrow down so much further than to just the island of Islay, or even a region of the island, but to the exact farm that grew it. Many are sceptical about how much of a difference these factors can make in a whisky, but have a dram of a few of Bruichladdich’s hyper-local productions and I’ll be surprised if you’re not converted. It is quite possible that Bruichladdich could produce such a high quality whisky at a relatively young age with barley that had come from anywhere, which would mean that Bruichladdich put a hell of a lot more effort into this release than even their standard (but still quite exceptional) Classic Laddie – which I just don’t believe. Sure I’d believe they put some extra effort in, but this release is just phenomenal. 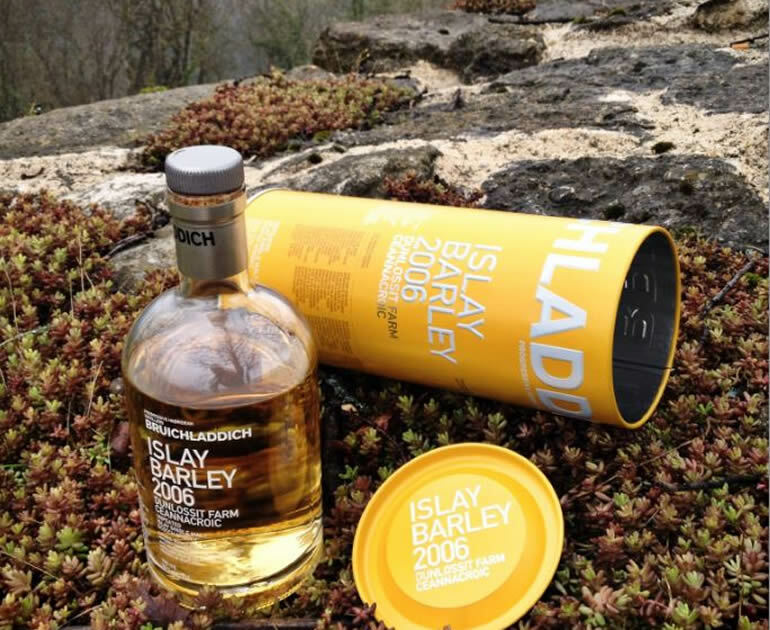 Inside the tin, the bottle is bundled with a booklet detailing all sorts of fascinating facts in regards to not just this whisky, but also the history of growing and malting barley on the island – which didn’t grow any barley by the end of the first world war, and how many are now in production (16 were growing barley for Bruichladdich at the time this bottle was released), and how all of this interacts with, and impacts on, the Islay economy and way of life. It also includes detailed information on the Dunlossit Farm, where the barley for this release was all grown – and even includes tidbits in regards to how the barley grew, which field it came from, and when it was harvested. Amazingly detailed information really. The whisky itself is quite amazing for a whisky that is just five years old – it’s rich and creamy with quite a mellow base of a whisky that really should be much older, yet at the same time is also so fresh and alive like the youngster it is. Somehow the two completely opposite aspects mesh together seamlessly. Only two other whiskies that I can think off the top of my head (undoubtedly there are others) that manage this to the degree with which Jim McEwen (Bruichladdich’s master distiller at the time this was produced) has accomplished with this whisky – and those are the Octomore range from Bruichladdich itself, and the Double Cask release from Sulivan’s Cove in Tasmania, Australia. This really is a top-notch whisky with a presence that outweighs its young age, and a mouthfeel that is unrivalled by anything I have yet had the pleasure of trying.